Edmonton voters re-elected the same eight MPs Monday they voted for in 2008, with the NDP's Linda Duncan elected as the only opposition MP in Alberta. Edmonton voters re-elected the same eight MPs Monday they voted for in the 2008 federal election, with the NDP's Linda Duncan elected as the only opposition MP in Alberta. "What we have now is a Conservative majority," said Conservative Laurie Hawn, who was re-elected in Edmonton Centre, about the national election results. "God, that sounds good!" Duncan was declared the winner in Edmonton-Strathcona after facing a challenge from Conservative Ryan Hastman. "I'm going to have a lot of colleagues. We're moving to a bigger meeting room I guess," Duncan said. The NDP became the official opposition after winning 102 seats. Duncan won 53.6 per cent of the vote in Edmonton-Strathcona; 40.5 per cent went to Hastman. Hastman said people on his campaign worked hard and did the best they could. "Linda Duncan ran a great campaign. She's a great candidate. It's hard not to like her. It's hard not to support her," he said, adding that the NDP benefitted from an "unprecedented generational wave." 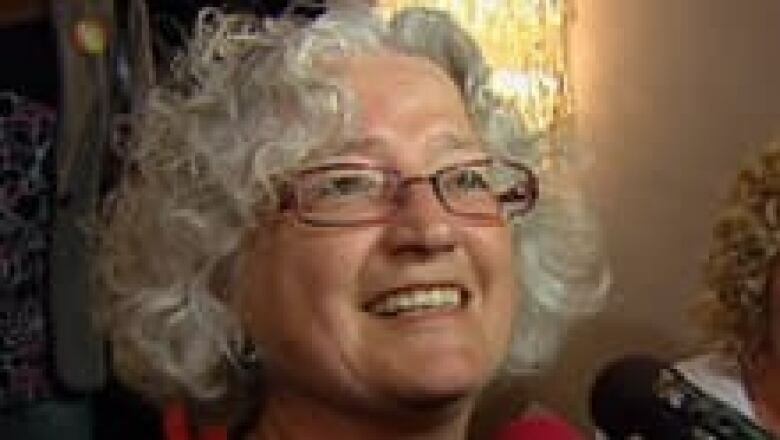 NDP candidate Linda Duncan was re-elected in Edmonton-Strathcona. (CBC)"Sometimes your best-laid plans still fall short and I'm going to sleep well tonight knowing we gave it our best." Rona Ambrose was re-elected in Edmonton-Spruce Grove; Brent Rathgeber won his seat in Edmonton-St. Albert; James Rajotte was elected in Edmonton-Leduc and Mike Lake won back his seat in Edmonton-Mill Woods-Beaumont. 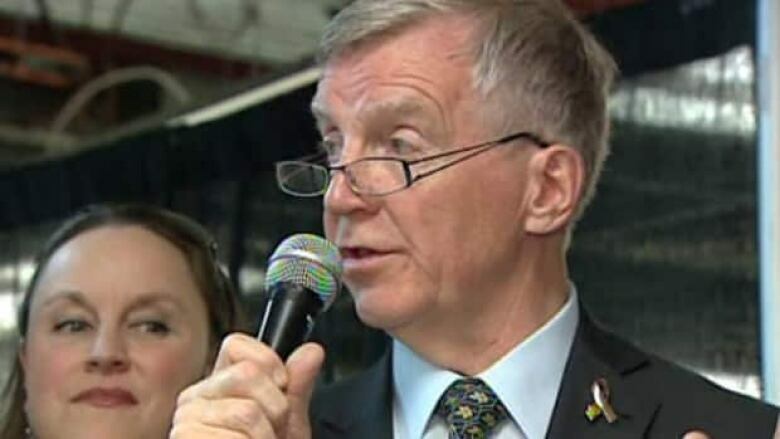 Conservative Peter Goldring was able to hold back a challenge by Ray Martin from the NDP and was re-elected to another term as the MP for Edmonton East. Martin came in second with 37.5 per cent of the vote, compared to Goldring's 52.8 per cent. Shafik Ruda from the Liberals came a distant third with 6.9 per cent of the vote. Martin, a former MLA and provincial NDP leader, said this would be his last election. Conservative Tim Uppal arrives at his campaign headquarters after he was declared the winner in Edmonton-Sherwood Park. (CBC)"I guess in politics you never say never but this will be my last hurrah," Martin said. "We went out with a bang ... it's time to step away and let the next generation come forward." In Edmonton Centre, Hawn won 47.9 per cent of the vote. NDP candidate Lewis Cardinal came in second with 25.7 per cent of the vote and Mary Macdonald from the Liberals took 22.3 per cent. 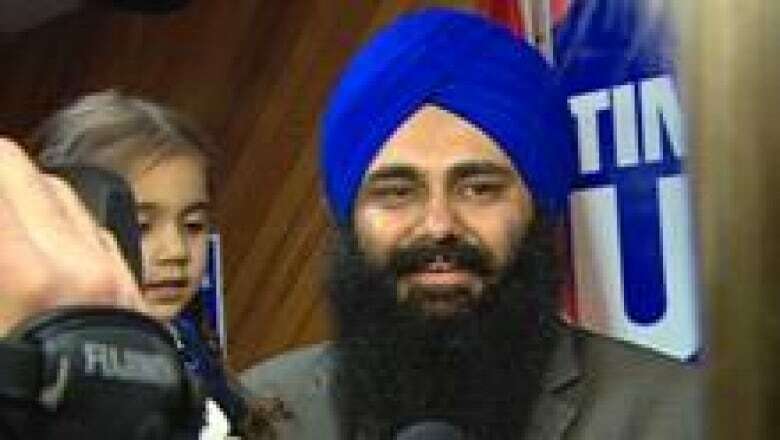 In Edmonton-Sherwood Park, Conservative Tim Uppal was re-elected for another term despite a challenge from another conservative-leaning candidate — Independent James Ford. Uppal had 44.6 per cent of the vote compared to Ford's 29.5 per cent. "It's a great win here in Edmonton-Sherwood Park. But more importantly, it's a voice in a Stephen Harper majority government," Uppal said as his supporters started to cheer.